Welcome to Lord & Associates Inc. Thank you for taking a moment to consider Lord & Associates, Inc. for your traffic control needs. We are a certified D/WBE in Oregon (#884) and Washington (D2F0615097). Federal Tax ID # 93-1219162. Our commitment is to provide you with safe, reliable and professional service. Your safety is our top priority! 24 hour dispatch service. Certified Traffic Control Supervisors. CAD Traffic control plans. Traffic control flagger certification courses. Sixteen years of direct management in all aspects of traffic control. Certified Public Accountant with Seventeen years experience. Our management team is in place to assure that your billing, contract, and other administative needs are handled in an accurate and timely manner. Our workers compensation, auto and general liability limits fill the specific requirements for all public and private works. Certificates of insurance will be sent upon request. 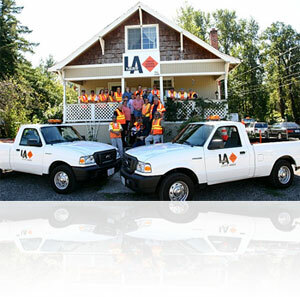 We work regularly for various IBEW Local 125 utilities as well as private Utility and Construction companies such Portland General Electric, Henkles & McCoy, Pacific Power , North Sky Communication, Michaels Comm., Rutan Const, , James W Fowler, Robinson Con., and Bones Con., to name a few. 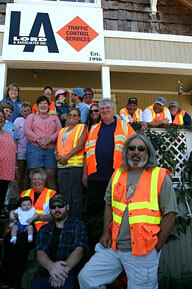 Certified Traffic Control Flaggers Courses are scheduled as needed and can be held at our facility or yours. Discounts for groups of 8 or more. Please call for upcoming schedule and rates. We understand the specific traffic control needs unique to various industries including utility, road construction and geotechnical explorations. We apply and enforce all OSHA and ODOT safety standards. We have adequate resources to complete all projects and are confident that we can provide experienced, reliable flaggers at a reasonable price. If you have any questions, we invite you to call us at: (503) 777-4902. Thank you again for considering Lord & Associates, Inc.